Even as the Gujarat state assembly elections draw nearer, the Congress should not forget: The August Rajya Sabha polls, which saw Congress chief Sonia Gandhi's political adviser Ahmed Patel victorious under extremely odd circumstances, has clearly brought out that the BJP will use everything at its command, every authority in its armoury, using means fair or foul, to bust its opponent. The ends justify the means. And there are reasons for it. No doubt, the perception of the Gujarat Rajya Sabha election, which concluded on August 8, is that the brute might of the BJP-government and the party working in tandem, has been busted by the sheer grit of Ahmed Patel and the Gujarat Congress. Call it a conspiracy of colluding factors or just happenstance, but the BJP juggernaut in Gujarat, has been steadily going downhill, while the Congress graph is on the upswing. One needs to finely go through the sequence of events leading to the victory of Patel if events that followed are to be viewed in proper perspective. A morale booster it surely has been for a Congress wracked by a battlefield desertion and key elements walking into the rival camp. But an election victory is never complete in an era of poor losers. The renegade Congressman turned BJP candidate, Balwantsinh Rajput has challenged the decision of the Election Commission in the Gujarat High Court but the judicial system here grinds too slowly for instant relief. The fact of the matter is that the AICC chief’s political advisor quite literally snatched victory from the jaws of defeat. It is lawyer leader Shaktisinh Gohil’s knowledge of parliamentary procedures, his quick thinking and a momentary lapse by two of the Congress rebels, Raghavji Patel and Bholabhai Gohil, owing allegiance to the raja of rebellion, Shankersinh Vaghela that saved the day for Patel. Their votes were invalidated by the Election Commission and he scraped through by the skin of his teeth. When the election process began it was billed as a placid affair. Three seats were coming up for re-election and by sheer weight of numbers two would go to the BJP -- party chief Amit Shah and union minister Smriti Irani -- and the third to the Congress' Ahmed Patel, political advisor to AICC. Then Shah in concert with his boss decided to raise the stakes and link it to strategic moves to destabilise it’s already battered principal opponent, both in the state as well as at it’s centre. So it was that a simple poll turned into a pressure cooker contest that will influence state and national politics. Gujarat goes to polls in 2017 and India two years thereafter. Three principal players of opposing sides -- Narendra Modi, Amit Shah and Ahmed Patel -- slated to play a key role in both polls hail from Gujarat. Two of these were directly involved in the Rajya Sabha election that concluded on August 8 and the shadow of the third loomed large over the entire proceedings. The contest turned into a slugfest when BJP poached three Congress legislators turned one of them, a party chief whip (Balwantsinh Rajput) into their third Rajya Sabha candidate thereby setting the cat amongst the pigeons. Three others resigned their Assembly seats over the next few days, bringing the Congress strength down from 57 legislators to 51. Shah went all out to defeat Patel and the Congress was forced to shepherd 44 of it’s 51 remaining legislators to the safe confines of Karnataka where the party is in power. In a brazen, even naked demonstration of it’s power of pursuit, central agencies conducted raids on the houses and establishments of the minister who was looking after the Congress legislators. This could not have been possible without clearance from the highest authority in the government. However, for all its pains, the BJP managed to break only one of the 44 legislators, Karamshi Patel. He had pulled off a ruse by feigning illness and his son was allowed to stay with him. It was this son who became Karamshi’s conduit to the BJP and he voted against Congress after enjoying it’s hospitality in Bangaluru. The Congress for a change showed a rare ferocity in latching onto the technical lapse, demanding invalidation of the two rebel votes for contravention of rules The BJP also refused to relent. When the scene shifted to the Election Commission in Delhi, both sides pulled out their top guns, former ministers and serving ministers lined up in a game of hu-tu-tu. The government pulled out all stops in a bid to pressure the national poll body but in vain. A video of the voting perused by the CEC clinched the issue for the Congress with the two votes held invalid and Patel joined Shah and Irani who managed their quota of 46 votes into the Rajya Sabha with a personal tally of 44 votes. 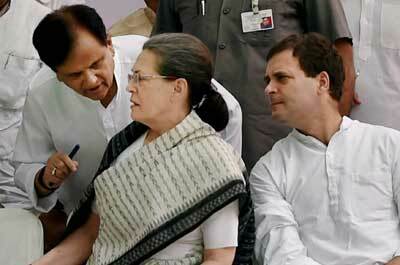 The BJP remains very wary of Sonia Gandhi personally and members of the Congress first family as a whole. The decimation of it’s credibility is the single-minded pursuit of the party in power.This is because it has witnessed firsthand her ability to virtually single-handedly pierce the ‘India shining’ shroud of the NDA government to sculpt the revival of the Congress led UPA which had a two-term rule. On an ideological plane,the idea of the Congress as a natural party of governance for over half a century has to be erased before the RSS-BJP version of ‘Bharat’ can be implanted. Ever since Modi left for Delhi, the ruling BJP has been floundering from one crisis to another. His 13 year rule in Gujarat turned him into a unitary command centre of both government and party. Both chief ministers who followed, Anandiben Patel and Vijay Rupani, paled into insignificance in comparison. Hit by ethnic strife and anti-incumbency, disenchantment has risen manifold. Patidars, the strongest supporters of the BJP are up in arms and the dalits in a rebellious mood. In such a backdrop,the only way to raise your stock is by pulling down your rivals. A Patel defeat would have restored some balance. However this did not happen. Patel’s victory could not have come at a better time for him. He is now the ‘tarzan’ who survived the onslaught of the Modi government and the ‘surgical strike’ of Shah’s party, no mean a feat. Within the Congress, the youth brigade led by Rahul Gandhi who were pushing the old guards into oblivion will now have to contend with a rejuvenated Patel. His writ now runs large both in the ensuing polls in the state as well as nationally within his own party. He showed his fangs by sacking 14 party leaders including Shankersinh Vaghela and his son, no sooner he was elected. But more than just a pyrrhic victory will be needed to end the over three decade old poll draught in Gujarat this year and claw the Congress back into national reckoning in 2019. Nevertheless, the worm seems to be turning!